THE KILLER SHREWS (1959) James Best, Ingrid Goulde, Gordon Mclendon, Ken Curtis. "The shrew devours everything…flesh, bones, marrow…everything.” This is what low budget, ‘50s sci-fi was supposed to be all about. Scientists breed giant, carnivorous shrews that terrorize a small island off the Texas coast. Nice performances with Curtis playing a wonderful coward. From 16mm. Plus: THE GIANT GILA MONSTER (1959) Don Sullivan, Lisa Simone, Shug Fisher. 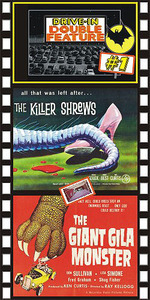 Much of the same low budget charm as its companion film, THE KILLER SHREWS. A gigantic lizard terrorizes a small Texas community. It smashes cars and trains and devours people as though they were flies. Lots of cool hot rods. Not to be missed. From 16mm.